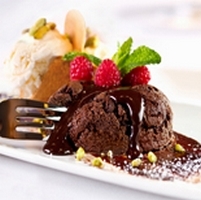 Flemings Chocolate Lava Cake taste great. From dinner recipes, budget menus and healthy diet selections, you’ll easily find any recipe you need. Cut butter and chocolate into small pieces then place in a mixing bowl. Set over top of a double boiler with simmering water. Heat the butter and chocolate until melted. While chocolate is melting, combine whole eggs and egg yolks in a mixing bowl and whip until slightly thick. Add sugar to eggs and whip for 1 minute to blend. Lightly whip the chocolate and the butter until smooth. Add the egg mixture to the chocolate and mix well. Fold in flour and combine well into chocolate mixture. Spread additional room temperature butter and flour in 6 small cups.Combine butter and flour making a smooth paste. Make sure to cover all areas in the cup. Fill each cup equally with batter to about half an inch from the top. Cook cake in 350 degree oven for 18 – 20 minutes until it is firm on top with a slight crust. Remove the cake from the oven and allow to cool for 1 – 2 minutes.Carefully tip cup onto a plate.Garnish with raspberry sauce or chocolate sauce, fresh berries, chopped pistachios, sea salt and vanilla ice cream (optional).